You all know him now, don’t you? And Gilroy, you’ll be pleased to learn, was a native of Whitley Bay. Born into a large family in 1898, Gilroy followed his father William into the world of art. His dad was a marine landscape painter and technical draughtsman, and by the age of 15 young John was being paid for producing cartoons for the Newcastle Evening Chronicle. He went to school in Sandyford and Heaton (the family were by then living in the latter suburb) and ended up at Armstrong College Art School, Durham University. He served in the Royal Field Artillery during World War I, and recommenced his studies at the Royal College of Art, London, in 1919. Prior to his graduation in 1923 he won many awards, prizes and scholarships, and went into teaching thereafter. He married his wife Gwendoline in 1924, with whom he was to have a son. In 1925 he began his long-running association with Benson’s advertising agency. 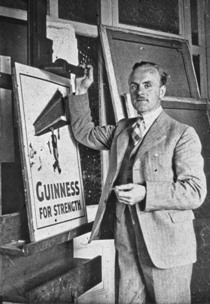 He worked on numerous commercial ventures (Bovril, Maclean's, Colman’s Mustard, etc) before his employers won the Guinness contract in 1928. 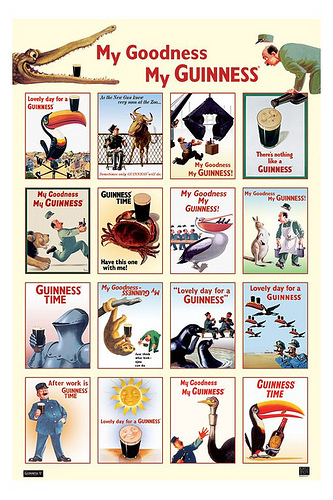 Beginning with his first effort in 1930, he turned out more than 100 press advertisements and nearly 50 posters for the stout brewers over a 35-year period, the most famous being the ‘Guinness for Strength’ and ‘zookeeper and animals’ campaigns. From the 1940s he worked freelance. Gilroy was also an accomplished painter of landscapes and portraits – including paintings of Churchill, the Royal family and the Pope. He exhibited regularly at the Royal Academy, and during World War II his work could often be seen via the Ministry of Information’s many campaigns. After his second marriage in 1950 he began an association with greetings card manufacturers, Royles. He was appointed a Freeman of the City of London in 1981, and died in Guildford in 1985, aged 86.